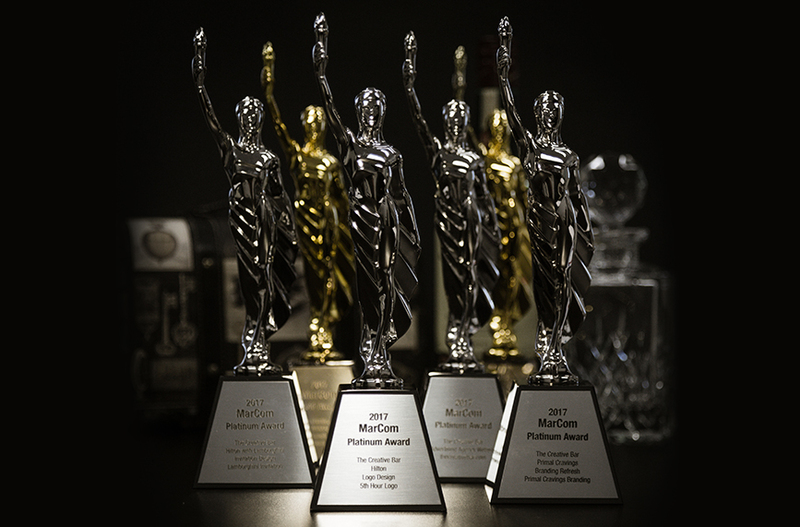 The Creative Bar is honored to have taken home 5 Platinum and 4 Gold trophies from this year’s MarCom Awards! This creative competition is for any individual or company involved in the conceptualizing, writing, or design of print, visual, audio, and web materials. Entries are judged from a wide variety of industries, including corporate marketing and communication departments, advertising agencies, PR firms, design shops, production companies, and more. The MarCom statuette graces the trophy cases of some of the top business and communication firms in the world and has grown to perhaps the largest of its kind with about 6,000 entries per year. A look at the winners shows a range in size from individuals to media conglomerates and Fortune 50 companies. The Creative Bar is proud to be included in this elite set of talented professionals and looks forward to continuing to produce award-winning work in 2018.